TIRED OF MOLES HAVING A PARTY IN YOUR YARD? 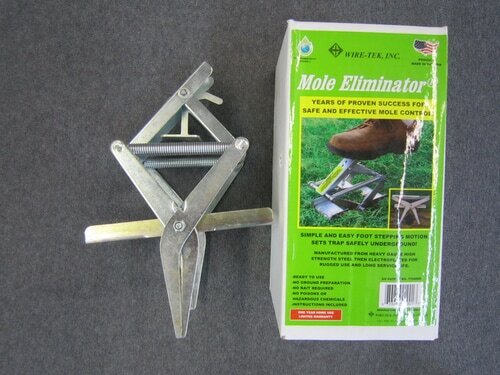 Mole Scram is an organic, granular repellent used to reduce and eliminate moles from your lawn. It is also an excellent preventive measure when used in the spring and fall. 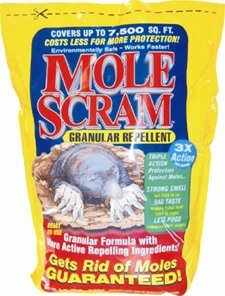 Mole Scram will safely & naturally stop mole infestation if used as directed. Mole Scram is GUARANTEED to work. The Eastern mole, prevalent throughout much of the eastern half of the United States, lives primarily underground. One mole may damage an entire lawn up to one acre in size. The mole’s main food is the earthworm, which is 80% to 90% of their diet, followed by insects and grubs. Other mole species demonstrate similar behavior. Mole Scram’s triple-action formula coats earthworms with a digestive system irritant, makes their environment smell disagreeable, and also reduces the activity and presence of other insects that comprise the moles’ diets. Using the shaker container or rotary spreader, cover the entire area where moles are present. Apply Mole Scram on Day 1 to 50% of lawn, starting at the area farthest from where you want the moles to exit, then water for approximately 20 minutes. On Day 2, apply Mole Scram to remaining 50% of affected lawn and water in the same way. Locate mole runways, punch 1-inch holes every 10 feet and drop granules into the holes and cover with soil. Also apply to the end of each runway. Apply 1 pound per 750 square feet. NOTE: Watering (rainfall) is the key to activation. Moisture draws the active oils from the Mole Scram granules into the soil. This action rapidly begins the repelling process. A 4 1/2-pound container will protect approximately 3,375 square feet. A 10-pound bag will protect approximately 7.500 square feet. Mole Scram should be applied at the beginning of spring and then fall, the two highest mole activity seasons. Moles may not exit your property when repelling them, regardless of the repellent used. They may burrow underground up to 5 feet to avoid the repelling action, if they cannot find another home. As a result, you may have to re-apply in summer if heavy rainfalls occur and bring earthworms to the surface. Earthworm surface activity may attract moles as the worms are an important part of moles’ diets. However, mole damage will be greatly reduced through the use of Mole Scram, which will cause them to dig food runs and tunnels in a more attractive environment elsewhere. Mole Scram is a proprietary blend of natural and organic biodegradable ingredients, specifically designed to reduce and eliminate mole activity. Our all-natural organic repellent contains strong active ingredients that eliminates moles where it's placed in your yard, gardens and landscapes. While Mole Scram is fast acting, it may take up to a week for moles to associate their discomfort and hunger with the treated areas. Mole Scram is both organic and biodegradable and will naturally break down over time.